It’s a sunny Sunday morning here in London – the end to a perfect week of beautiful weather and loads of exciting stuff going on. If you don’t know by now, the Olympics came to London this week and the torch relay did the rounds of every borough in the city in the run up to the opening ceremony. (BTW did you watch it on Friday night? Bonkers and brilliant!) 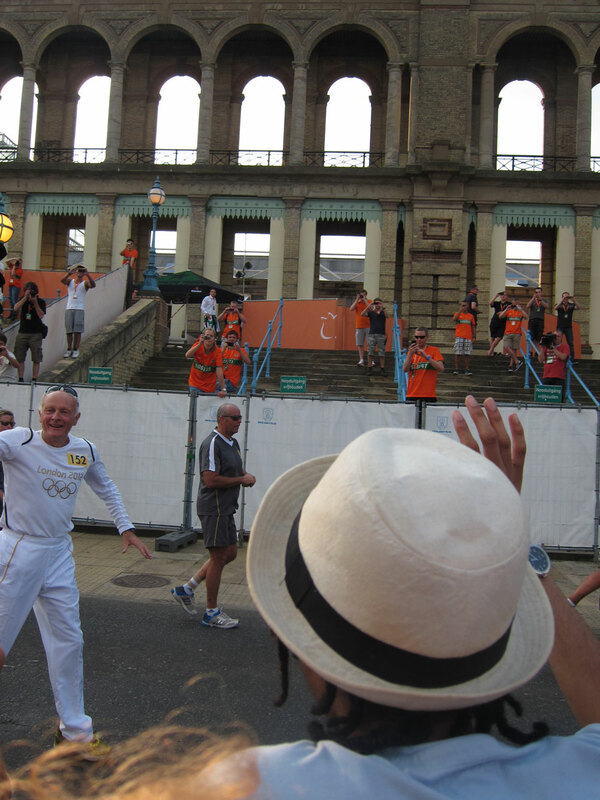 The torch visited Alexandra Palace on Thursday night so we headed up the hill to see it go past. Um – I took lots of pics but not one of them had the torch in it. See that guy in the white tracksuit? He’s holding the torch – in his RIGHT HAND, which is OUT OF THE FRAME! My mum was staying with me this week so we took advantage of the gorgeous weather to enjoy a day by the seaside. 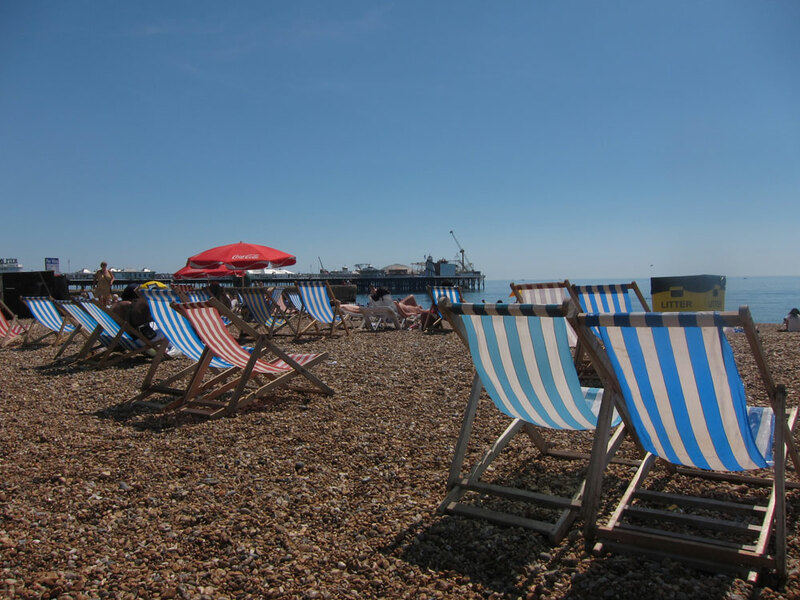 Brighton beach! Whilst in Brighton we took a stroll through through the North Laines and came upon Ditto fabrics. well of course I had to nip in and check out their sale which isn’t available online. 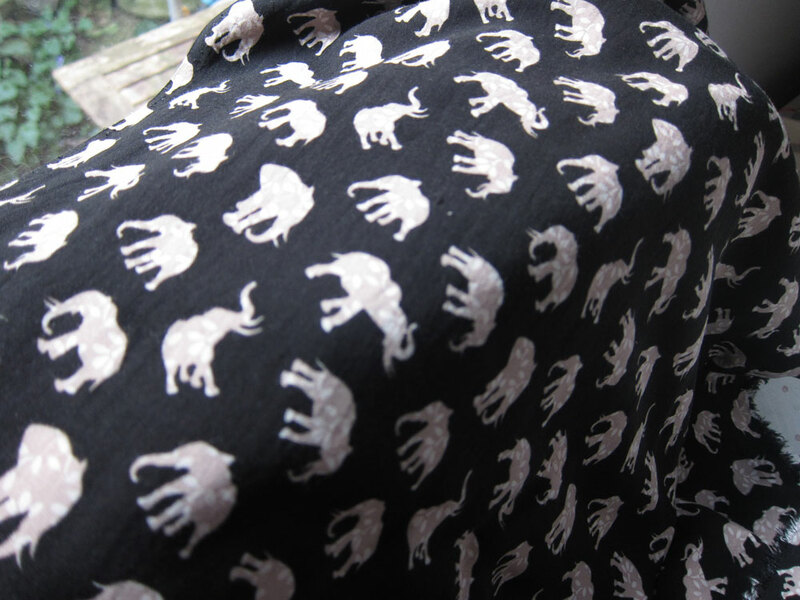 I picked up three metres of this cute elephant print viscose for just over £15. It has a lovely silky drapey feel to it. We also found a brilliant bric-a-brac shop in North Laines, where I came upon a fantastic collection of vintage buttons and threads. I picked up these little babies. Here’s what I’m working on this weekend. 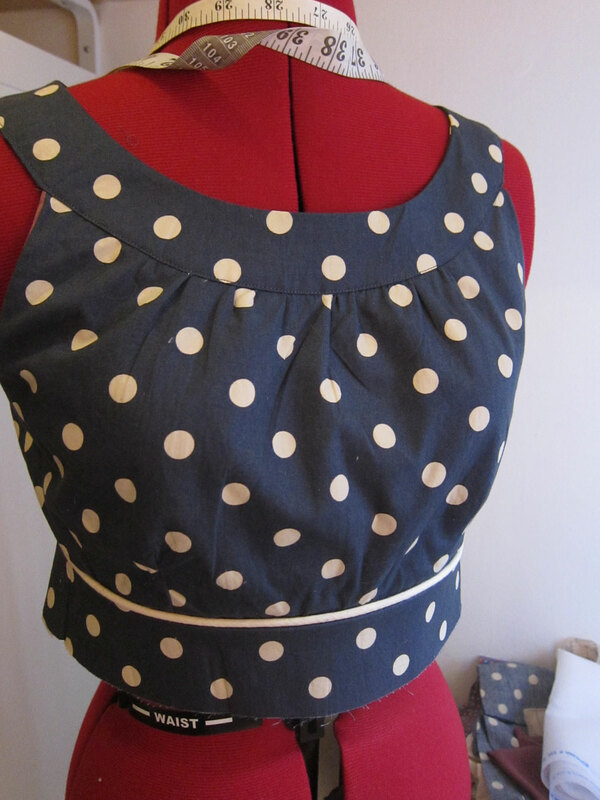 It’s a petrol blue polka dot version of New Look 6864, as used in my Maximum Awesomus dress. And I’m using calico covered piping! This version will be knee length or shorter and is lined in a rich magenta. Although I can’t wait to finish it my beloved mummy is coming to stay with me for a week and she arrives today! We’re hoping to knock out a Violet for her while she’s here so stay tuned for progress reports. London has been a hotpot of scary looking rain clouds, biblical rainfall and the odd intermittent break of glorious sunshine (witness the pics!) over the past few weeks. There’s only one thing for it – a maxi dress of awesome-ness that keeps you cool, modest and removes the need for depilation. Hooray! The sun finally made an appearance in the back garden this morning so I hurried out to make the most of it. 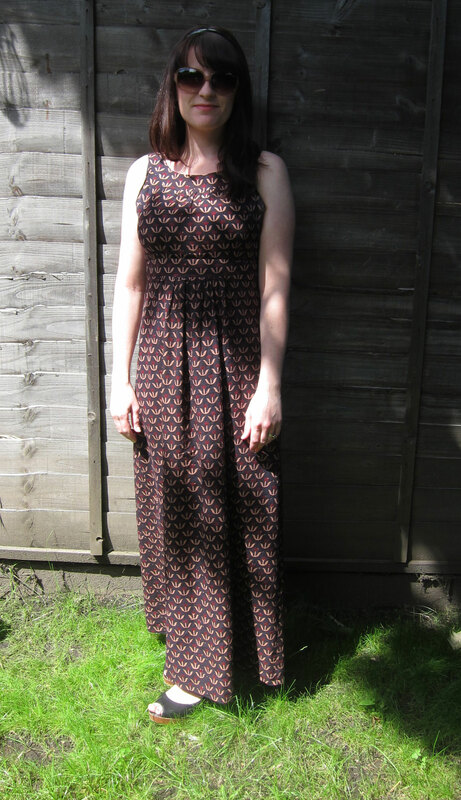 I’ve never been a fan of maxi dresses as I find all too often they swamp my 5 ft 2 inch frame. But I’ve been toying with the idea of making one to suit my height and body shape after Mela made a really stunning version using New Look 6230. Let’s get into the deets. 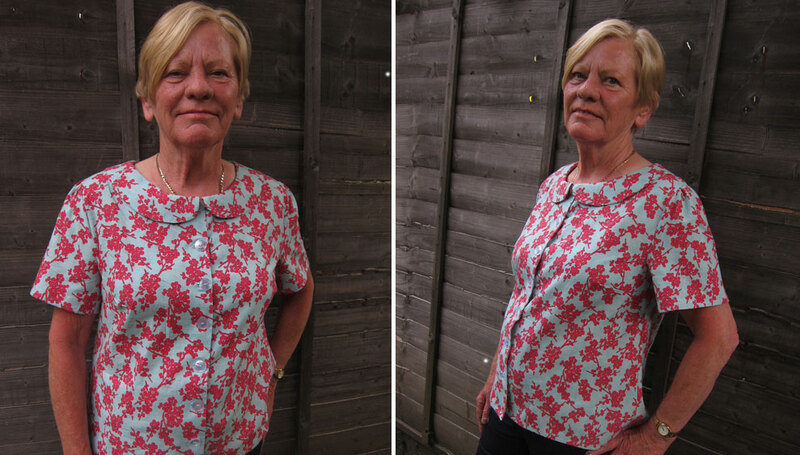 Pattern review: New Look 6864 View A+B+I+K. Difficulty rating for StitchandWitter: 2 out of 5 – fairly straightforward. Fabric and notions used: 3 metres of hand-blocked Indian cotton, one 20 inch zipper. Total cost of dress (not including pattern): About £2.50 with gratis fabric. Fitting issues: None actually – I cut out a straight size 10 in the bodice and a 12 for the skirt and it fit pretty much perfectly. There are only two darts under the bust; everything else is gathered so as long as you make sure the empire panel under the bust fits and the neck panel looks good you’re pretty much good to go. Making issues: Um.. in my excitement to get this dress sewn up as quickly as possible I neglected to notice that the bodice actually calls for a lining. I only realised my mistake after I had attached the neck panel and thought to myself, “Hmm – those arm holes are unfinished… I wonder when the instructions will tell me to fix that… oh.. hang on… oh s*i*b*lls!” But all was not lost. I did a quick rescue job by turning the edges back a quarter inch and stitching, then another quarter inch and stitching. It’s not perfect, but it’s really not noticeable. The zip could also do with a better finish on the inside for the same reason (forgetting the lining) but I can definitely live with it. Skills learned: Continuing with my love of the French seam, pretty much all seams are nicely finished on this project. Makes such a difference knowing your seams are in order – it’s a bit like getting knocked over but knowing it’s alright because you’ve got fresh undies on, y’know? I also had my second ever attempt at a lapped zipper and I think for the most part it worked out ok. I still get a bit confused about how a 5/8 and a 1/2 inch seam allowance join together into a standard 5/8 seam allowance without some trickery going on but sometimes the magic doesn’t reveal itself to us because we are not ready to understand it. How long did it take? Not long – I think probably about 6-8 hours in total. Will I make again? 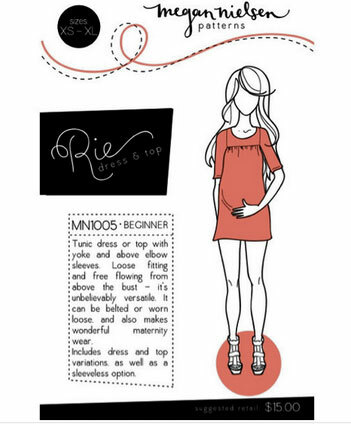 This dress is a perfect maternity option as you can add extra width under the bodice and then just gather to add more room for the bump. 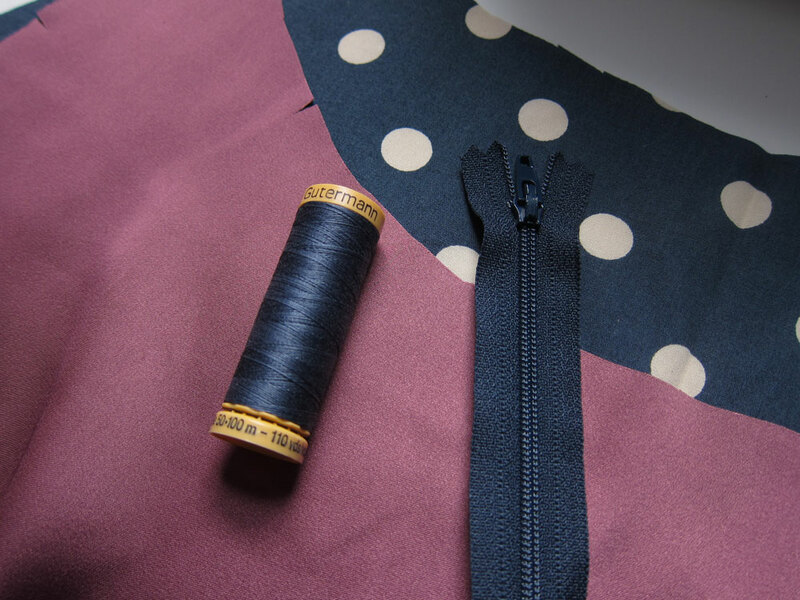 I plan to make a shorter version using some petrol blue polka dot cotton (previously earmarked for another Simplicity 2444 – reluctantly shelved for now) and a magenta lining. Not one… but two packages. What fun! Amazing! 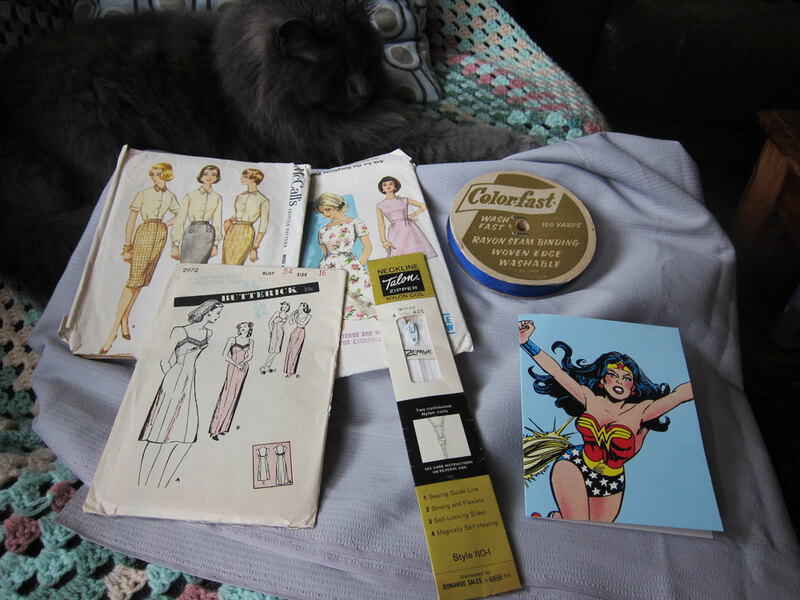 Not only did I pop along to the post office to find my sewing swap package from Leah had arrived, I also received an unexpectedly early package in the post this morning. I am now the proud owner of no less than ten new patterns and a bunch of other wonderful bits and bobs! 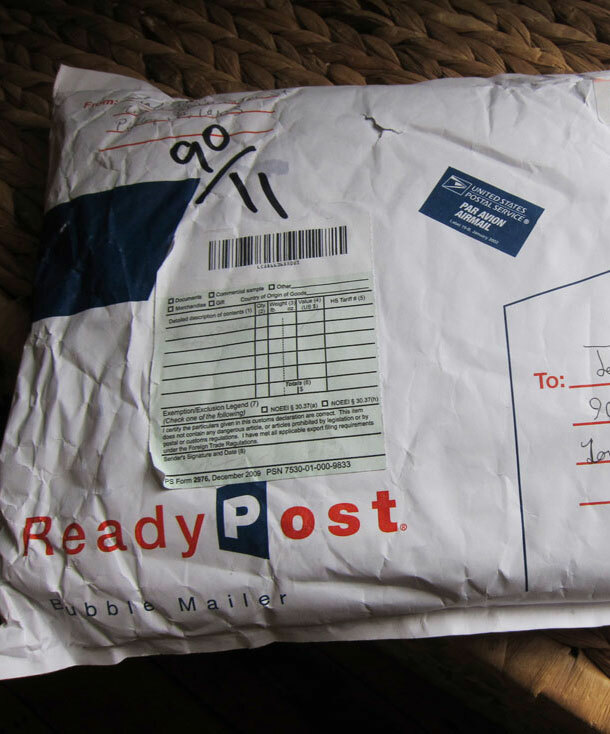 First up – Leah’s package. Don’t you just love packages? Especially international ones. They make me feel so excited and childlike. I love sending them, but I especially love receiving them. I was so not disappointed. Leah had gifted me with not one but three stunning vintage patterns. 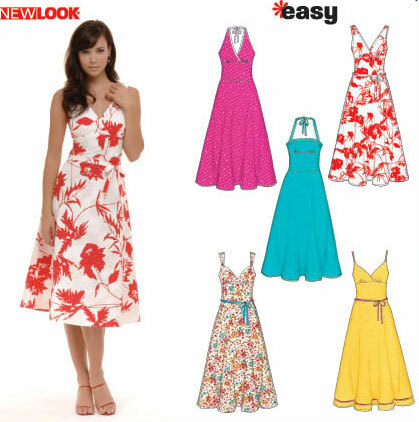 A glamorous slip from Butterick, a sophisticated skirt from McCalls and the most darling dress from Simplicity. Plus she included over two metres of some fabulous fabric, a vintage zip (from her grandmother’s attic no less) and 100 yards of seam binding! 100 yards! Seam binding! I’m so chuffed. Thank you so much Leah and I hope you enjoy your package as much as I did mine. After my announcement and plea for patterns that wouldn’t make me feel like a ten tonne Tessie, Dibs of Dibs and the Machine got in touch and said she had a couple of maternity patterns to send over and would I send her my address. Um, do I need to be asked twice? Dibs is obviously the most efficient person ever; I only gave her my address a few days ago and today a bumper parcel arrived in the post with SEVEN amazing maternity patterns. Check them out! I am speechless. These are all fantastic and I can’t wait to get stuck in. 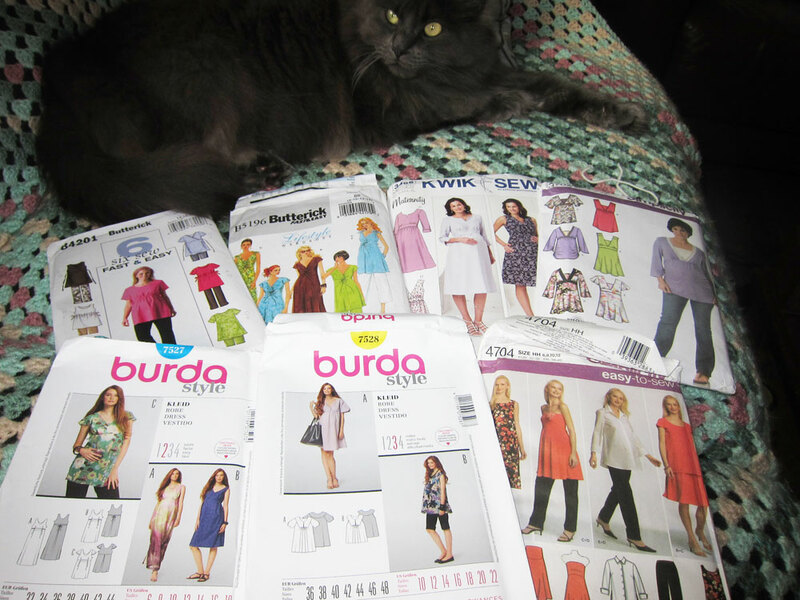 I’m torn between the Kwik Sew dress and the Burda tunic on the left. Thank you so much Dibs. You are a queen. Once again, and I know this is said a lot in this community but I for one feel it can’t be said enough, I am blown away by the kindness and largesse of you seamsters out there. What a brilliant Saturday morning it’s been, and it’s only 12.20! 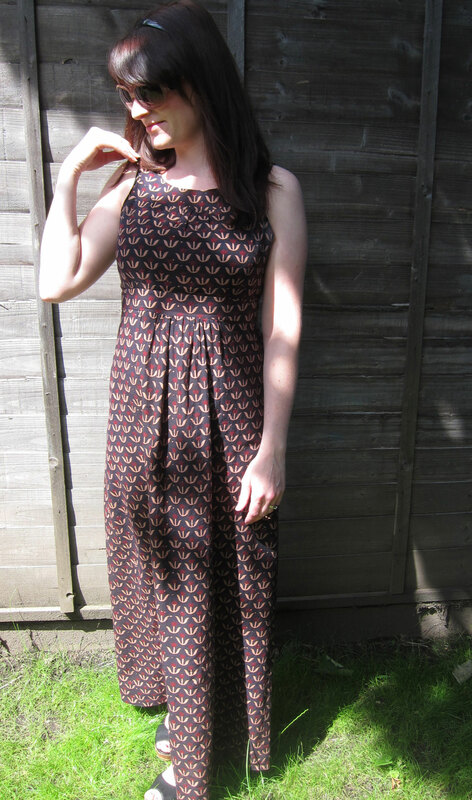 I hear the sun is coming out tomorrow in London (we’ve all forgotten what it looks like here) so I’m hoping I’ll finally get a chance to model the maxi dress I’ve been promising you for so long. Can you guess what it is? Do you like the colour combo of petrol blue and muted magenta? I took this shot for Did You Make That’s fantastic round up of mystery works in progress. Jump on over to see more bonkers and brilliant pics and try and guess what each might become! I’ve had a go already but I think I’m waaaaay off. I’ll be popping over to the post office later to pick up a mystery package too. I could be wrong but I think it might be a package from Leah of Struggle Sews a Straight Seam, who I was paired up for Kerry’s Sewing Swap project. Ooh the anticipation! I shall report back. 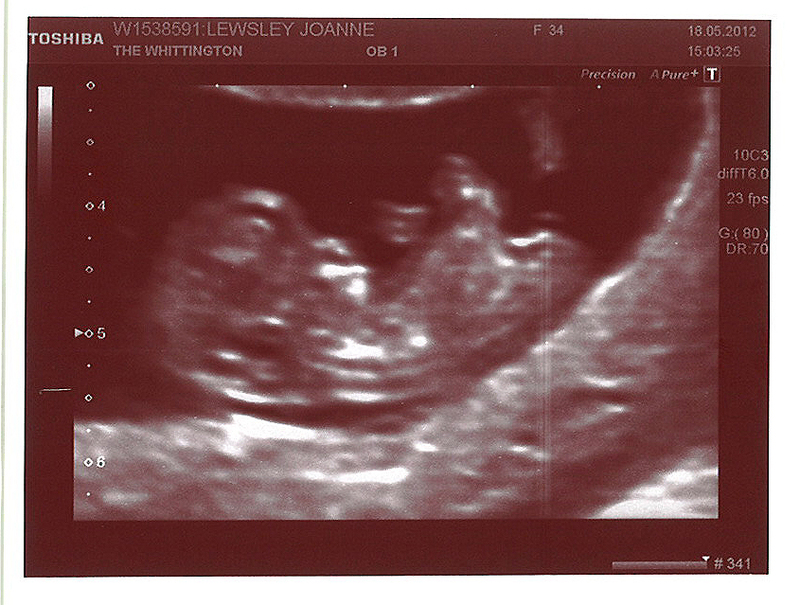 Thank you all for your amazing comments on my recent announcement. It really brings a warm glow to my heart when I think of all the well-wishers out there in blog land smiling at my news and taking a moment to wish me and the bump the best! Sigh and sniff indeed. You also totally came through when I pleaded for pattern suggestions that wouldn’t make me look like a tent. They came thick and fast – beautiful maternity styles, the cutest empire line dresses, bloggers who’ve tackled maternity patterns and tons of tips on sewing with jersey. 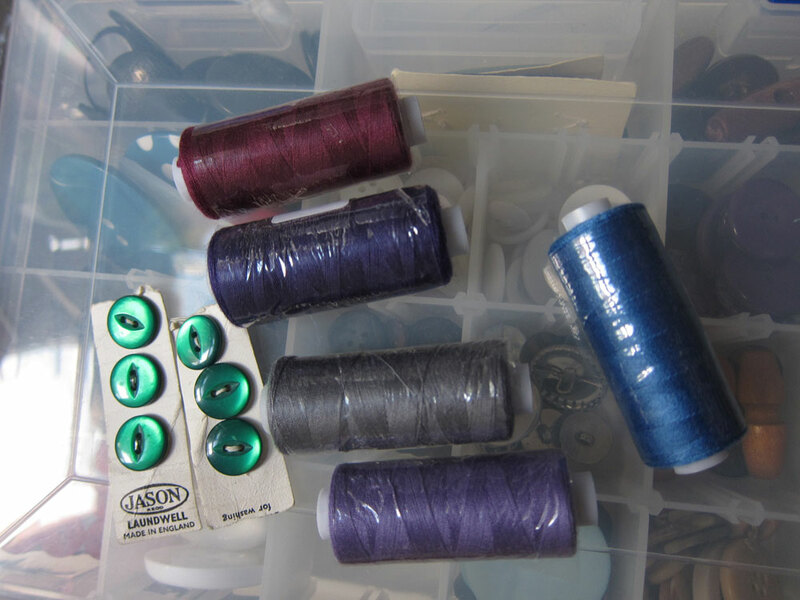 It’s really made me consider getting an overlocker, something I have always promised myself when I got good enough and had lots of projects under my belt. Now seems like an opportune time. I’ve already picked out my model – the Brother 1034 as recommended by Karen as well as countless other bloggers. I have yet to buy though… I’m still thinking about it! So here’s a round up of some of your fabulous suggestions. Note – they’re not just for preggers peeps! Lindsay suggested New Look 6803. 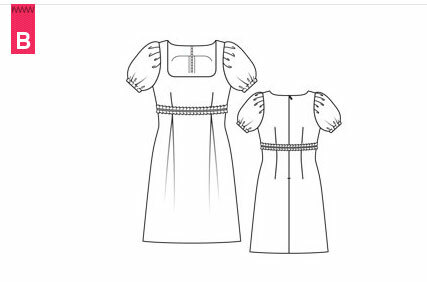 A great little pattern with plenty of room for growth and the option for just a tunic or a dress. Clare pointed out that New Look 6802 could be adapted for breastfeeding as well as providing a flattering fit around the bust. I’d really have to up my jersey sewing skillz for this one, but I LOVE the twisty feature at the front – so cute. Marianna suggested Burda 7378 and I have to say I’m a bit smitten with this one, though I have yet to tackle a Burda pattern! Can you believe it? I’m a Burda virgin! A Burgin, if you will. Isn’t the maxi version so glam? Ginger popped up with New Look 6022 – another great little casual shift dress that could be shortened into a top. Not sure about that drawstring pouch though! Abby suggested altering New Look 6557 slightly to accommodate a growing bump. I love the halter top but not sure if my sewing skills are up to the adaptations to the rest of the dress if I’m honest. Maybe one for post baby body inspiration? Doesn’t the top remind you on Jane’s gorgeous Cherry Fabulous dress? Kat H recommended the Danielle dress from Burda with its empire bust and loose skirt. Cute shape isn’t it? 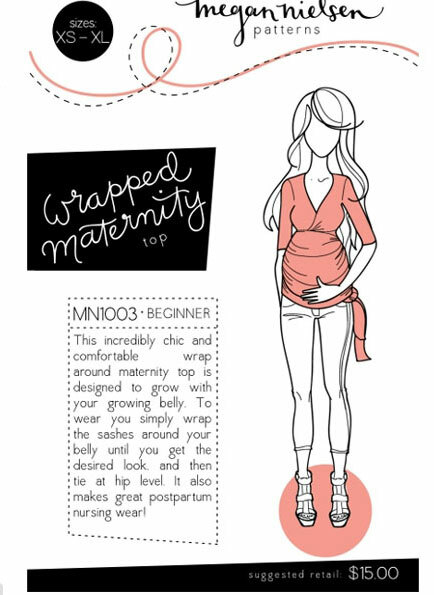 In terms of actual maternity patterns, Megan Nielsen is a firm favourite. Loads of you suggested checking out her lines of separates, especially the Wrapped Maternity top, as recommended by Tilly. Actually I’ve already been checking out her designs and they are so, so cute. I already have the Rie dress (which can also be shortened into a top) which I think I simply have to try next, but this top is inching up the waiting line already. Here’s the Rie dress if you’re not familiar with it. Huzzah! Brave women have been there and done that already, some of them multiple times! I got loads of suggestions from you on sewing bloggers to get inspired by so I’ll be adding them to my reader immediately. My apologies for being so quiet round these parts recently. I have a very good reason though. For the last week I’ve been laid low by a bout of fibroid pain. For those not in the know, a fibroid is a benign growth in the womb that usually is quite happy and chilled out until something sets it off. Something like this, for example…. Look at that – it isn’t even a cat! Hehe – yep. I’m pregnant! I’ve been meaning to mention it for a while now, not least because the more eagle-eyed amongst you will notice the ever-increasing bump and ever-decreasing lack of side-on shots I’d be posting. But things kind of got in the way, like agonising fibroid pain! I’m now almost 18 weeks gone and all seems to be well. Don’t worry – this won’t become a baby blog. But it may well become a quieter blog as i feel my way though this experience. 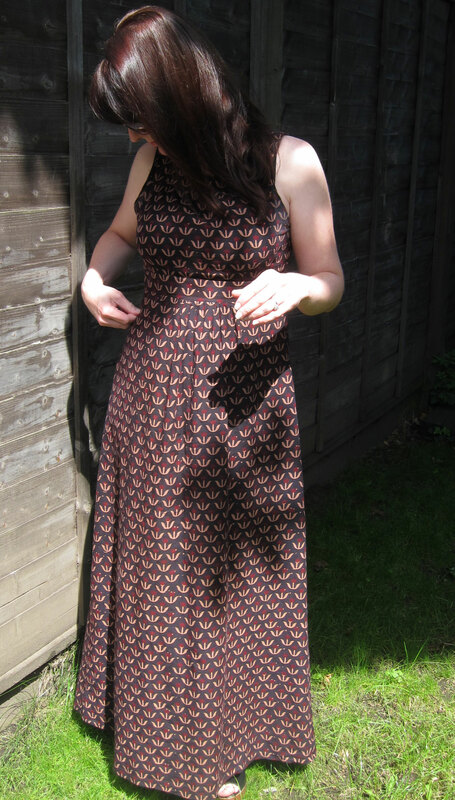 But I do have a fabulous new maxi dress to show you and as soon as madame sunshine makes a rare appearance dans the jardin I’ll be whipping up some pics and sharing it here. In the meantime I’ve been wistfully looking at some of my dresses and wondering if I’ll ever fit in them again! Anyone recommend any good non-maternity patterns (i.e. not parachute-style smocks) that might suit a growing bump?